The only thing surprising about Gov. 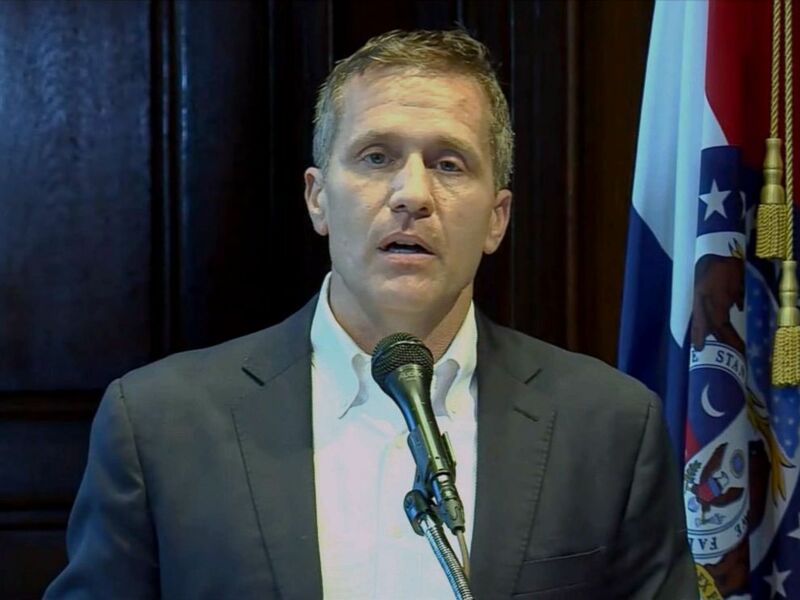 Eric Greitens’ resignation announcement yesterday afternoon was the timing. With the pressure mounting on him by the hour, and with his days of reckoning approaching, it seemed as if an announcement could come at any time. So, as a reader, I would like to have seen news reports focus on two things: The timing of the resignation and a detailed description of Tuesday’s behind-the-scenes maneuvering and the attendant emotions and tensions on display. I have now read several newspapers’ accounts of the governor’s announcement, and none was satisfying on its own. Particularly disappointing was The Star’s front-page story. Now, granted, this was an incredibly challenging assignment, with the governor taking the podium at 4:15 p.m., and all reporters, photographers and camera operators involved had to move very quickly. Still, as great a job as The Star has done reporting developments leading up to the resignation, I would have expected a much better story than what it produced. :: The frenzied activity and preparation that attended the news conference and, later, Greitens’ body language and appearance. Regarding the timing of the resignation, The Star didn’t report until the fifth column of text — 28 inches into the story — that earlier Tuesday a Cole County judge had ordered a political committee formed by Greitens to submit critical information to a Missouri House investigative committee. The main thing I was looking for, however, was a description of the behind-the-scenes maneuvering and preparation that led up to the dramatic announcement. The Star had nothing, absolutely nothing, related to that, and it was extremely disappointing. Understandably, Hancock and Lowry were focused on the political situation, but an editor should have had one of them, or another reporter, write only about the atmospherics. If you want to know what I mean about atmospherics, the St. Louis Post-Dispatch came closest to covering the lead-up to the big announcement. The governor’s end came in a mad scramble that was, for some, emotional. Around 3:15 p.m., a Post-Dispatch reporter stopped by (Lt. Gov. Mike) Parson’s office to see if his press secretary, Kelli Jones, had heard anything about a possible resignation. “I have not heard anything,” she said. Two other Greitens officials, Drew Erdmann and Will Scharf, declined to respond to reporter questions as they walked down the hallway. Capitol maintenance workers hauled a podium up a spiraled Rotunda stairwell and to Greitens’ office. A line of reporters and other Capitol staffers began to gather outside Greitens’ office. Greitens’ chief legal counsel, Lucinda Luetkemeyer, wept during and after the governor’s announcement. Afterwards, Erdmann, who was brought in to serve as the chief operating officer for the administration, was asked what’s next. He could only shrug. Pretty good, pretty good. But I wish the PD’s story had also contained a description of Greitens at the podium — the look in his eye, the tone of his voice, movements or expressions that reflected defiance, acceptance or internal struggle. What I wanted was the “sights, sounds and smells” from yesterday afternoon — all of them. Unfortunately, none of the stories I read captured them satisfactorily. …Yes, I am a tough, demanding reader. But, really, what I’m asking is not too much. And I’ll bet a lot of readers would have appreciated an insightful, accurate report of those sights, sounds and smells. I suspect the turning point in this drama was Greitens’ attorneys telling their client that, once the documents become public as per the court’s ruling, his best option is to plea out. Stepping down is the obvious first step. That conversation apparently took place earlier in the day. As I said before, I really thought Greitens would gut this out and slip by, wounded but still standing. I think: the judge’s order to produce campaign documents to the House Committee spooked the big money boys. They were paying his legal bills. (Did they refuse to continue?) The St. Louis computer felony charge was dropped. The prosecutor said the governor’s defense team brokered the deal. Someone needs to follow the money! on May 30, 2018 at 12:35 pm Thomas Shrout Jr.
Kauffman in KC exits the stage. You get my drift: a better writer could have done something with this. Yes, that painting to Eric Greitens left portrays James S. Rollins, who gave farmland to the State of Missouri for the establishment of a college. There are other figures in the remainder of the mural, but I forget who they are. The mural hangs in what I have heard called the Oval Room, much, much larger than the Oval Room in the White House. There was a reason that our beloved Laura Rollins Hockaday carried Rollins as her middle name. James S. Rollins was a (great?) grandfather. on May 30, 2018 at 4:33 pm Thomas Shrout Jr.
On the mural theme and reporters doing more to set the stage and add color, another mural in the room where Greitens spoke is of Susan Blow https://en.wikipedia.org/wiki/Susan_Blow founder of kindergarten. Related… I just scrolled through Politico, Daily Beast, NYT – and there is NOTHING on the Greitens story. Apparently political news from that area between the Rockies and the Mississippi River doesn’t count. The New York Times had the story on its front page yesterday, and The Washington Post played it big, too. National news had it almost every night, too. I did see a NYT story about Lt. Gov. Parson by Maggie Astor after diving in deeper, so I stand slightly corrected. Didn’t check WaPo. But I still believe that flyover country isn’t too high on the national journalism outlets’ storyboard. And ABC, NBC, CBS et. al. covered the Greitens saga, I suspect, because of the salacious nature of some of the allegations.